On September 1, 1939, the Polish Defensive War and World War II started. The German 3rd Army was to advance from East Prussia towards Warsaw, directly through the positions of Polish Narew Corps. On September 2 Captain Władysław Raginis was named the commander of the Wizna area. As his command post he chose the "GG-126" bunker near the village of Góra Strękowa. The bunker was located on a hill in the exact centre of the Polish lines. His forces numbered approximately 700 soldiers and NCOs and 20 officers armed with 6 pieces of artillery (76mm), 24 HMGs, 18 machine guns and two Kb ppanc wz.35 anti-tank carbines. After initial clashes at the border, the Podlaska Cavalry Brigade operating in the area, during the night of 3rd/4th of September was ordered to withdraw and on September 5 it left the area and marched toward Mały Płock to cross the river Narew. On September 3 Polish positions were spotted from the air and strafed with machine gun fire from enemy fighters. On September 7, 1939, the reconnaissance units of the 10th Panzer Division of general Nikolaus von Falkenhorst captured the village of Wizna. Polish mounted reconnaissance squads abandoned the village after a short fight and retreated to the southern bank of Narew. When German tanks tried to cross the bridge, it was blown up by Polish engineers. After dark, patrols of German infantry crossed the river and advanced towards Giełczyn, but were repelled with heavy casualties. On September 8 general Heinz Guderian, commander of the XIX Panzer Corps, was ordered to advance through Wizna towards Brześć. By early morning of September 9 his units reached the Wizna area and were joined with 10th Panzer Division and "Lötzen" Brigade already present in the area. His forces numbered some 1 200 officers and 41 000 soldiers and NCOs, equipped with over 350 tanks, 108 howitzers, 58 pieces of artillery, 195 anti-tank guns, 108 mortars, 188 grenade launchers, 288 heavy machine guns and 689 machine guns. Altogether, his forces were some 60 times stronger than the Polish defenders. 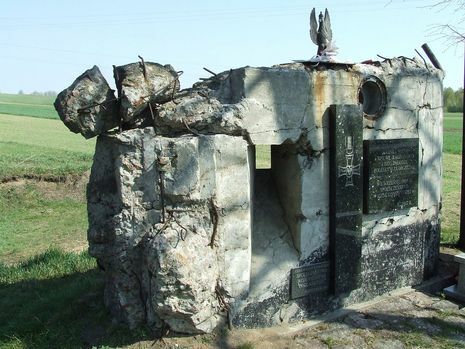 On September 7, 1939, the reconnaissance units of the 10th Panzer Division, under the command of General Nikolaus von Falkenhorst captured the village of Wizna. Polish reconnaissance squads abandoned the village after a short fight and retreated to the southern bank of Narew. German tanks tried to cross the bridge, but it was blown up by Polish engineers. 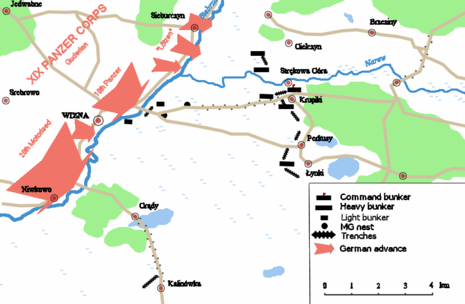 Although, after dark, patrols of German infantry crossed the river and advanced towards Gielczyn, they were thrown back with heavy casualties.